Many teenagers have a fear of missing out, but the anxiety is especially easy to understand in young people with long-term health conditions. It is a concern that Willow Cracknell, who loves rugby, hockey and swimming, began to have after being diagnosed with kidney problems. Willow must now attend Southampton Children’s Hospital three times a week for dialysis and is hoping to get a kidney transplant in the spring. The DofE awards scheme recognises teenagers and young adults who develop skills through activities and challenges, and Willow can now work for the awards because Southampton has become the first hospital in the country to offer the scheme to patients. It does this by coordinating activities for the children to take part in outside of their time at the hospital. 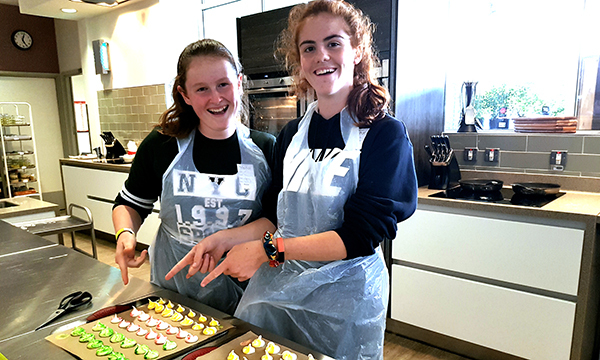 Willow has even drawn on her experience of illness by adapting favourite recipes to make them suitable for other patients with kidney problems as part of her work for the DofE scheme. Her condition means she must be careful about the meat and water she consumes. Southampton Children’s Hospital’s head of nursing Louisa Green says: ‘For young people it develops a can-do attitude. It builds their self-esteem and reduces that sense of isolation. ‘You can see their faces light up whenever they do anything to help other patients. It’s great for their self-confidence and for building socialising skills. It was an awareness of how critical this period is that gave consultant paediatric nephrologist Arvind Nagra the idea to offer the DofE award through the hospital. She thought it would be a good fit with the hospital’s Ready Steady Go (RSG) knowledge and skills programme, which was developed in 2013 to support children to manage their healthcare as they move to adult services. Chronic conditions worsen for a significant number of young people when they make the transition to adult services. ‘Patients report lower self-esteem, increased sense of social isolation and greater anxiety, as well as poorer rates of employment, compared with their well peers,’ Dr Nagra says. Arrangements have been made to recognise an element of RSG to help empower patients as part the DofE award requirement, says Dr Nagra. Patient participation in the DofE programme will be funded by Southampton Children’s Hospital Charity and Creating Learning Experiences aVailable At Hospital, or CLEVAH, a charity that helps chronically ill children. NHS England experience of care lead for children and young people Kath Evans says there is a need for innovative approaches to grow young people’s resilience and confidence, especially when they have complex health needs. ‘Southampton is a pacesetter. It is the first NHS organisation to be an accredited provider of the DofE. Ben Tibbles jumped at the chance to work towards a Duke of Edinburgh (DofE) award when he was approached about joining the scheme. He has kidney failure and was on dialysis from May 2018 until he received a kidney transplant in October. He comes to the hospital three times a week for checks. As he works towards his award, he has committed to doing 10,000 steps a day to help boost his activity levels. He checks his steps via pedometer on his phone. ‘The 10,000 steps helps me stay active. The medication you are on can make you quite fat. It’s good for me. It will keep me fit and healthy, as well as giving me experience for the DofE award. Ben is also using his experience of illness to help others. For the volunteering part of the DofE award he is using his experience to speak up for other patients at the hospital. ‘There was a group of people doing a project on helping children in hospital feel better so I did a piece to camera about empowering children in hospital so that they can put their ideas forward and are heard by doctors and people higher up. Before he became ill, Ben he played drums for a Dorset Youth marching band, now he volunteers as quartermaster for them and looks after the drums, bugles, cymbals and xylophones, fixing damaged instruments and making sure all the equipment is clean and tidy.